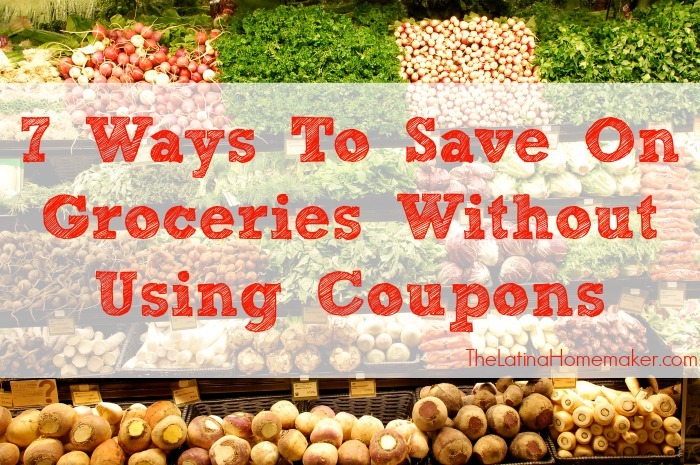 Simple tips to help you save money on groceries without using coupons! Once upon a time I was an extreme couponer. Well maybe not that extreme, but I would spend hours planning, cutting and sorting coupons before heading out to the grocery store. I still enjoy scoring a great deal that enables me to stock up on diapers, paper products and other household items. However, as a work-at-home mommy of 3, I simply don’t have the time to clip coupons. So I’m sharing 7 tips on how I keep my grocery bill as low as possible without using coupons. Take inventory of what you already have at home. Often times we start writing up a grocery list without checking what we have first. If you see that you have spaghetti sauce, simply add pasta to your list for an easy meal. Just make sure you figure out what you already have and build your meals around it. This is a must if you want to save money on groceries. Make sure you take the time to write up a meal plan based on your current inventory and store sales. Once you know what you’ll be making throughout the week, you can easily create your shopping list. I know that anytime I make a “quick” stop at the grocery store without a list, I wind up spending way more than I wanted to. So planning is key if you want to see significant savings. When I create my meal plan, I make sure that I plan meals that use the same ingredients to maximize my savings. For example; if I buy a large pack of chicken breasts, I’ll use it to make chicken quesadillas, rice with chicken and chicken alfredo. This also helps me save time since I’ll precook all of the chicken and freeze it to have it readily available for meals. We all know how expensive meats can be even when purchased on sale. One way I reduce my grocery bill is by planning meals that don’t require any meat. Here are some examples of meatless meals: baked mac n cheese, vegetarian chilli, broccoli cheddar soup, quesadillas and my favorite, breakfast for dinner. Get creative and include a meal or two that doesn’t require any meat to help keep your grocery costs down. 5. Stop being a brand snob. I’m a huge Aldi’s store fan. Is not the only place I buy my groceries, but I do purchase a lot of my food items there. When I have mentioned this to others, I hear that they could never shop there because they don’t carry “XYZ” brand. I agree that cheaper is not always better. However, sticking to one particular brand is not going to help you save any money. I purchase my items based on what’s on sale for the week or I stick with store brands since they tend to be the cheapest. If I find that an item we frequently use is on sale for a great price, I stock up. I know I’ll be using it eventually, so I’ll spend some extra money knowing that it will yield savings in the long run. 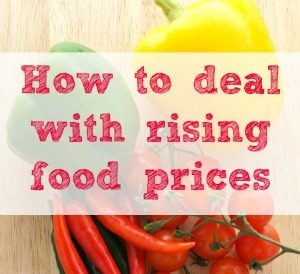 Budget some of your grocery money for items that will be on sale so that you can purchase extra and stock up. Make sure you check out your local ads before you head to the grocery store to plan accordingly. Have you ever tried purchasing a ham in the summer? It’s probably going to cost you triple (or more) of what it would cost around Easter or Christmas time. Grocery stores have what’s called a sale cycle. Basically what this means is that certain items will go on sale during specific seasons or months of the year. This is a great way to know what to stock up on and when. Living Richly On A Budget has a great guide that you can print out for reference. Click here to check it out. To help you with your savings journey, I’m offering a free shopping list printable that you can use to plan your grocery shopping. Simply click on the image below to download! You are so right about Aldi’s. Love that store for eggs, condiments, paper products to name a few. Your blogs are so instructional. Thanks for sharing your insights/knowledge. I have owned a small free standing pantry for extra food items and paper goods are kept beside it. The supermarket cycles are very true. I rarely use any coupons since they are usually on brand name products that the store brands are just as good. I own a meat grinder and grind my own beef and port to make meatballs, burgers, loaves, etc. Its cheaper and healthier. I stock up on sale items as much as possible and a meal out is breakfast about every other week. I eat mostly cereal and only the store brands. I also cook enough to last through 2-3 meals so that I don’t have to worry about what to eat every day. My food budget has increased by only about $15.00 in more than 25 years. Hi Dorothy! I never thought of using a meat grinder to grind my own beef, that’s a great idea! Thanks for sharing!